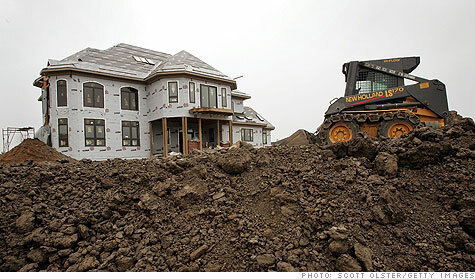 NEW YORK (CNNMoney.com) -- The American home is shrinking. Toll the bell for the McMansion. After years of growth, the Census Bureau recently reported that median new home size fell to 2,135 square feet in 2009 after peaking at more than 2,300 earlier in the decade. "Home buyers are asking for less, cutting back on options and reducing square footage," said Steven Pace of the North Carolina-based Pace Development Group, which builds both custom and tract houses ranging in price from below $250,000 to more than $2 million. "They're saying, 'Maybe we don't need that 5,000 square footage;" he said. "'Maybe our bath doesn't need to be big enough for our whole family and all our neighbors to take a shower at the same time.'" Kermit Baker, chief economist for the American Institute of Architects, pointed out that consumers don't ask for as much for spaces devoted to single purposes, such as media rooms for watching videos and game rooms for shooting pool. Instead, the requests are for rooms with shared uses. "We continue to move away from the 'McMansion' chapter of residential design," he said. QUIZ: Do you have an All-American house? Now, the typical U.S. owner-occupied home has six rooms, with three of them being bedrooms, according to the Census Bureau's annual American Housing Survey. The most common number of baths is two or more. For those who remember the days of long, hot summers. Those are over, too. Nearly 90% of all new homes now have central air conditioning. And 63% of all homes are now cooled. These are a big increases from even 10 years ago, when only 52% of owner-occupied homes -- i.e. non-rental properties or second homes -- boasted central air. More than three-quarters of all homeowners now load up dishwashers, up from 65% a decade ago. And garbage disposals can be found in nearly half of owner-occupied homes, up from 46%. On a broader scope, the survey revealed that, despite the recent hoopla about the new urbanism and return to cities, most Americans still lead a "Leave it to Beaver" lifestyle. Of the more than 76 million owner-occupied homes in 2009, 63 million were traditional detached, single-family residences. And city dwellers, you're outnumbered: Far more homeowners live in the suburbs than in cities. The latest real estate rip-off?